Some time ago I read the first of James Douglas’s “Jamie Saintclair” thrillers, and I’ve been awaiting thne opportunity to get to the second. Well, now I’ve finally read The Isis Covenant. There is a certain genre of tale that was made popular by Dan Brown, owing to Indiana Jones and revolving around the mystical and the occult in the modern world. And despite Brown’s fame, there are plenty of writers who, to my mind, are better examples. One is Simon Toyne. Another is James Douglas. Douglas’ thrillers strike, for me, a superb balance. They revolve around an art dealer and antiquarian, which links the modern to the ancient and strikes a chord with the historian in me. And they revolve around mystical objects, whether they be true or simply misinterpretations of the mundane, which adds the thrill. And finally, at least with the first two books, they connect with the Second World War and the Nazi lunatics’ search for occult items to help empower their master race (a subject that’s a guilty pleasure for me). Superb mix, and guarenteed to hit the spot in at least some way for most readers. The Isis Covenant takes characters and some dangling threads from the first book in the series and reintroduces them, tugging on those threads and using them to weave a whole new story. A twisted son, a vengeful neo-Nazi, a stymied cop and Jamie Saintclair all seeking an ancient Egyptian crown and the priceless stone that has long been separated from it together believed to bestow prolonged life. And the search will take them into the world of ageing secret Nazis, Russian gangsters, American assassins and so much more. Utterly satisfying, well-plotted, gripping and colourful, the Isis Covenant is a perfect sequel to the first great book in the series. I suspect Ruso was my favourite investigator of crimes by the time I’d finished the first book in Ruth Downie’s Medicus series. The second book expanded this world to include darker themes and the wild north. And by the time Ruso went home to Gaul in the third book he was not only my favourite investigator, but one of my favourite characters in any book series. Left with something of an uncertain future at the end of that book, I wasn’t sure what to expect from the fourth book, other than being sure it would be highly entertaining. Caveat Emptor takes us back to Britain, where Ruso and Tilla (now man and wife) find themselves dragged into problems galore. Tilla becomes a friend and helper to a native woman who has got herself into disastrous trouble, her man the tax collector having disappeared with the money. Ruso finds himself appointed by the province’s assistant procurator to investigate the disappearance of the tax collector and his money. What follows is a complex and thoroughly engrossing investigation taking us from the docksides of Londinium (London) to the finance offices of Verulamium (St Albans). A plot that involves a fascinating and shady cast of characters from lurking town guards to power-hungry councillors to weaselly clerks to half-blind noblemen and so on. A plot that, I might add, while I grasped parts of the solution half way through, parts kept me guessing to the end. A plot that is not all it seems at any given point. But once more, the major wins of the book are the main characters and Ruth’s writing. Having met Ruth now, and discovered what a truly nice lady she is, it amazes me how she seems to be able to get into the mindset of hen-pecked males or vicious mysogenists or the like so well that they read as truly authentic. Ruso is at times hapless, at times heroic, mostly beleaguered and often confused. He is a man who tries to do the right thing, even though at times he’d like nothing more than to do the wrong one. Tilla is no barbarian, nor is she a Roman matron. She is not a charicature but a person, with all the complexity that implies. And as always with Ruth’s writing, the threads of gentle quirky humour that run throughout add counterpoint to the seriousness of the situations in which they find themselves and make the books something special and a delight to read. As the ostler had promised, the ginger mare was keen to go – but not necessarily forward. After winning the argument over which of them was steering, Ruso urged it out under the archway and onto the wide expanse of the North road. If that kind of writing doesn’t make you want to read, then I reckon nothing will. Caveat Emptor. A beautifully constructed mystery. And now I go on to read the next book – Semper Fidelis. I used to sit, cocooned in my own little Roman world, reading Roman books and not straying beyond that. In fairness, there’s so much good Roman fiction out there you can actually do that. But then new names, books and series pop up here and there and make me leave my comfort zone. 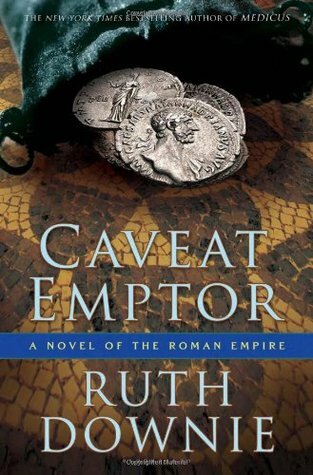 Recently I’ve been rather getting into my historical mysteries, everything from Roman to cold war and the whole gamut of eras in between. I was surprised at how immersive I found Robin Blake’s mysteries set in 1740s Preston. In fact, I loved them so much that when the publishers offered me a new title set in the 1660s I simply had to say yes. I’m very glad that I did. I’d not previously been aware of L.C. Tyler and assumed that he was a new writer. Boy was I wrong. Turns out this is the third in a series, and the author has many other mysteries out besides. In fact, he’s the chair of the Crime Writers Association, which gives you some idea of his pedigree. Excited at the prospect, I opened the cover and began. I almost put it down straight away. The book is written in first person, present tense, a tense that I find hard work and has put me off numerous novels in the past. I persevered. It took only a page and I got over it. I still don’t like that tense in books, but Tyler’s easy style completely negates any issues I ever have with it. Then I hit the second of my two snags. The protagonist is a lawyer in plague-struck London, 1665. He is propositioned by a powerful politician and drawn into a mission to retrieve a stolen document. At first the hook for the character seemed to me rather spurious. Why a lawyer would get himself involved in such things seemed unlikely. But once again, I was taking things at face value. You see, this is, as I said, the third volume in a series, and so I have clearly missed out on much character development (something I will be going back to remedy, by the way, as soon as I have time.) And as I ignored my problem with the hook (the maguffin if you will), and read on, the reasons gradually became clear as I came to understand the history of the various people involved. So that’s my intro. Two reasons I should have stopped reading by my usual standards. And yet I didn’t. Why? Well, for four reasons, I think. Firstly, there’s Tyler’s prose. It is a mark of just how good he is that I not only overcame my almost pathological dislike of that writing tense and even came to enjoy it! That’s a first. The style is easy while being elegant, direct and pacy without undue brevity, descriptive without being cumbersome. This is clearly the skill of an author who has long since honed his craft. Secondly, there’s the setting. I know a little about the restoration period, the plague and the great fire, but not a great deal, so exploring this world through the eyes of a clearly very knowledgeable man was new and fascinating. Thirdly, there’s the plot. In some ways this is a murder mystery, but it is so much more. It includes political shenanigans with far-reaching, country-threatening effects. It reminds me a little of ‘The Four Musketeers’, or possibly a restoration ‘Where Eagles Dare’. Complex and elegant. I wont immediately say ‘go and buy this book’ despite the fact that it’s published on the 6th. And I’m reviewing it early for a very good reason. Because what I am saying is that this book makes it worth reading the first two volumes in the series, and now you’ve got chance to get them and read them before this one comes out. John Grey is a new hero of mine. He will be for you too. Check out the series and do it soon. One of the best ways, in my experience, to guage the quality of fiction is how easy it is to read. Yes, there is some crap out there that is an easy read, and yes, there are great reads out there that require concentration and work. But more often than not a book that just grabs your attention and drags you along from beginning to end is a success. I find Anthony Riches’ books to be like that. They hook you in the first few pages, relieve you of sleep, food and work and occupy your waking moments until you reach the end and close the book with a smile. 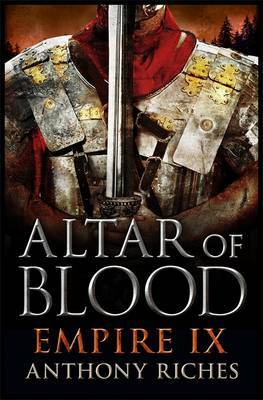 Case in point: Empire IX – Altar of Blood. Started it one morning. Finished it the next afternoon. Couldn’t stop reading it. Part of it now has become the familiarity with the characters, the setting and the writing style. By the ninth book in a series, readers know they’re going to get what they want. They’re on a safe bet. But kudos is due any author who makes it to book 9 in a series and isn’t simply rehashing old stuff. I pick up Riches’ books and I know I’m in for a treat, though. And even this far into a series, I know I’m in for new twists and fresh discoveries. Riches, you see, is unpredictable. He cannot be counted on to give us happily ever after, to give us tested formula for all my comments about familiarity. Riches might kill off someone important any moment. He will take us to new places and may even turn the tables so that previous friends are enemies and previous enemies friends. Such keeps things fresh. With the ninth in the empire series, there is a new feel to the start. Altar of Blood begins with viciousness and eye-watering brutality, and then settles down into an opening tale of tragedy. Then gradually, as our hero is put through the emotional mill yet again, the true tale of the book comes out. We are re-introduced not only to the usual characters but also to the wicked emperor and the snake Cleander. And then our heroes are sent off on a dreadfully dangerous secret mission into barbarian lands, following a brief ‘Dirty dozen’ recruitment session. Interestingly, where the previous books have focused primarily on our friend Corvus/Aquila with interludes carried by his friends, this book is almost entirely narrated around characters that were formerly supporting cast, with Aquila only occasionally coming to the fore. There follows a tale of subterfuge and double dealing, insurgency and counter insurgency, chases, battles in deep forest and swamp, catharsis and healing, treachery and betrayal and heroism in unexpected places. The tale owes something in form to ‘Heart of Darkness’ or ‘Apocalypse Now’, but one thing is certain: with Riches’ own blend of adventure, action, violence, harsh language and reality born of understanding the military mind, he is becoming something of a Tarantino of historical fiction. Fresh, unpredictable, fascinating and exciting. And Husam! Oh, Husam, you are sooooo cool. Altar of Blood is out in paperback today. Have you read the series? No. Then get started, as you’ve a treat ahead of you. If you have, then rest assured, volume nine is far from disappointing. Go buy it now. Fortunately, The Oracles of Troy is an excellent piece of writing. It tackles the end of the Trojan war only, long after Achilles’ death and the events of the Iliad. It deals with the fall of Troy and the end of the war, telling a tale that is rarely covered. In fact, early Greece is rarely touched by authors at all, so it is very much virgin territory, so this should be of great interest to all readers of ancient historical fiction. One thing that stood out for me is the legendary feel of the tale. While in our own work we tried to pare out the myth and work with a prosaic, real-world Troy, Iliffe has given the world of Greek myth full reign in his story, which makes it a whole different beast, and a fascinating one at that. In this era the lines between history and fantasy blur a great deal, as any student of Homer will know, and so we discover mystic visions, monsters, magical weapons and invulnerable heroes here in very much the mould of Homer himself. That adds a certain level of adventure to the story beyond straight history and pushes it into the world of myth. The result? Magnificent. And a book that should appeal to readers of fantasy as well as those of history. And at no point does the use of this legendary mythic aspect interfere with the readability or flow of the story. In fact, it is such an inherent thread that the tale would be comparatively dull without it. Beyond that, the characters deserve mention. This tale is told principally from the point of view of Odysseus (being part of the chronicles of that most wonderful hero.) But his is not the only view we are treated to. Sometimes we see through Diomedes’ eyes. Often through those of Helen herself. But most of all we are treated to a fictional character’s view – a man called Eperitus with a complex history, who travels as Odysseus’ closest friend and helper. And though Eperitus is Iliffe’s own creation, he syncs so well with the extant cast of Greeks and Trojans that any reader not fully conversant with Homer would never know it. The whole nature of Eperitus is so well constructed that I have to applaud the author on this most stunning piece of plotting. So grab a copy of the Oracles of Troy and set sail with Odysseus as he investigates ancient tombs, fights monsters, builds horses, sneaks into cities, becomes a master of disguise and brings about the downfall of the greatest city in the world. If ever there was a spoiler in the title, eh? But come on, we’ve been expecting this book for a while. Angus Donald’s superb Outlaw Chronicles have run to 8 books, which is pretty good for any series to maintain freshness and individuality, but we could see by book 6 that the characters were beginning to age and to look towards the end. And book 7 pretty much told us there was only one more tale to tell. And yet we’ve all hungered for this last outing for a year. Donald’s series has gone from strength to strength over the greater part of a decade. The first book was one of the most outstanding debuts ever written in the genre and, though the second was, to my mind, the weakest of the series, that was still a gripping book. But I had maintained throughout that my favourite in the series was King’s Man – the third. Until now. I know from personal experience how hard it can be to finish a series. Managing to engineer a plot that effectively ties up each and every loose end to a satisfactory level is nightmarish work. It is only when one tries that one realises just how much a series has exploded outwards over its course and just how much there is to resolve. And mine was only a four book series. Donald must have been head-scratching and fretting at this plot for a while. And yet however he went about it, he’s pulled off a real coup with this novel. The war between King John and his barons we encountered in book 7 resurfaces in this last tale, with Alan and Robin joined by old friends and new as they navigate the impossible currents of their masters’ politics. Fighting for justice against King John is one thing, but when those very rebels offer the throne instead to the French, then which was can a loyal Englishman turn? This is the dilemma Robin and his friends end up facing. That’s something of a spoiler, I guess, but an early one, and if I’m to tell you anything about the book at all, it has to include the fundamental point of it. From a brutal siege at Rochester castle, we follow the adventures of Robin and Alan across Kent and the south, imprisonment and war, betrayal and revenge, all the way to Nottingham and Lincoln. There are four points I think about this work that deserve specific mention. There is a sense of ‘full circle’ about book 8. In book 1 we met Robin Hood the outlaw, running a vicious godfather-like world and carrying out guerilla war in the forests against the authorities. Over successive books, Robin had changed, achieving legitimacy, title and a role at the heart of the Kingdom. Here, now in book 8, we are treated, at least for a while, to a return to form. There is a sense that despite the characters’ now rather mature age, we are seeing them relive their youth and the excitement of those rebel days. This I loved. This, for me, is what I will take away from the novel. Angus Donald is rapidly becoming the ‘master of the siege’. It can be extremely difficult to include at least one siege in a book multiple times within a series. I’ve done it myself, and it’s very easy for them to become blase and samey. There are sieges throughout the Outlaw Chronicles, and some of the books pretty much centre on one (The Iron Castle, for example.) And in book 8, there are two sieges to handle. And you know what? They are exciting, unpredictable, fresh and superbly-executed. Every siege Donald handles he manages to produce something new and worthwhile, which is a masterful thing. The characters are fluid and changing. It is ridiculously easy to maintain a character, and it is equally easy to mess up their progression. To have your characters grow old and mature over a series in a realistic and noticeable way while maintaining the traits that make them who they are is a skillful thing. Alan and Robin, Thomas and Miles, plus their many companions, are painted well and have grown with the reader. Even the absence of Little John does not mar the sense of character at the heart of the book. Finally, the death of Robin (see? I told you the title held a spoiler.) Such a momentous event – in history, let alone at the climax of a series – has to be handled just right. To have Robin die in some glorious golden way would be cheesy to say the least. To have him butchered out of hand in a sad, random manner would leave the reader huffing grumpily. To achieve something that is realistic, tragic, sad, noble and personal is a real bonus. And that is how this book ends. It is all those things, but I think the most important point is that it is personal. Robin’s end is not some great battle scene like the one that took King Richard. It is the result of strands of the tale long in the making, and it is truly a personal thing. Also, it took me by surprise in the end, which is magnificent. Oh, not that he might die – note once more the title – but how it might come about. In short, The Death of Robin Hood is a tour-de-force and has shot to the very top as the best in the series, which is fantastic for a finale. If you’re not read the books, you’re in for a treat, because there are 8 now waiting for you and you can demolish the whole tale from beginning to end. If you have, then fear not, loyal readers. Donald has done you proud. This book ends the Outlaw Chronicles with a bang AND a whimper. It’s out today. Go buy it… trust me. I’m behind on reading one of my favourite series, but I’m catching up now. The Lone Warrior is the fourth book in Paul Fraser Collard’s excellent mid-nineteenth century series and, coincidentally is out in paperback today. Jack Lark bean some time ago in The Scarlet Thief as something of an anomaly, an imposter. A low-ranker impersonating an officer. It was a very singular tale with, as far as I could see, little scope for an ongoing series. Then Paul surprised me with The Maharajah’s General, which repeated certain elements of the first, with impersonation and subterfuge, but also blew a hole in the very idea by revealing his true self and sending the series on something of a sharp tangent. This was good as a series, especially one with such a unique concept, would soon become stale if it simply repeated that concept over and over. So the third book – The Devil’s Assassin – took us in new directions. Jack was no longer wearing a mask, and instead went into tremendous action as his true self. And at the end of that book, he was free of his long-standing lie and released from the military. So when I came to Lone Warrior, I truly had no idea what to expect. Jack was no longer in the army. He was no longer pretending to be someone he wasn’t. What could happen next? In fact what does happen is a new and fascinating angle. What could drag Jack back into the world of war and danger? What else but a woman. And the danger? Well Jack has faced it in the Crimea, with a rogue Maharajah and then in Persia. And throughout the second book, when he was serving in India, I kept wondering when we would encounter the Sepoy Mutiny, one of the few great events of Raj history of which I’m actually aware. And now, in book four, we’re there. I won’t spoil the plot. If you’ve read the other books then you know what sort of thing to expect. If not, you’re in for derring-do and thunderous action. A character who is down-to-earth and practical living in the world of the English gentleman amid a sea of the empire’s enemies. All right, I’ll try to nudge the story without ruining it. Jack has fallen for a girl. It’s easy to see why when you read her. And after saving her from some dreadful people, he agrees to take her back to her home in Delhi. His timing is somewhat poor, arriving in the city the day before said Sepoy Mutiny kicks off and drags the whole of India into war, challenging English rule and almost succeeding. And so Jack finds himself in a city besieged by the enemy. Oh it doesn’t end there, and Jack finds himself once more serving with the British, displaying his forte – the art of killing. And therein lies what for me is the great strength of the novel: the British siege of Delhi. The action is brutal and thick and fast and the pace never lets up. Nor, incidentally does the horror or violence, though Collard manages to enfold it all in a great epic tale of adventure and sometimes Flashman-esque action. But yes, to the siege. There are two movie sequences that to me portray the utter chaos of battle better than all others. The lesser of the two is the opening to Gladiator. The better is the start of Saving Private Ryan. Well, that is what you’ve got in Collard’s siege of Delhi. This is a third of the book at least, with all the action, intensity and brutality of the D-Day landings. It is warfare masterfully told. Gloriously horrifying, and it proves once more that Paul Fraser Collard is at the top of his game and the top of the genre. Lone Warrior is exhilarating and packed with vivid characters and scenes and deserves to be read. Go buy it, people.